Oh, Hell Yeah! 2016 Funko WWE Mystery Minis Series 2 brings a new lineup of wrestling legends. The set includes Stone Cold Steve Austin and Bret “Hitman” Hart. With an action-packed checklist featuring legends from the both WWF and WWE rosters, these figures are certain to please almost everyone. Unlike the 2015 release, which featured the Superstars resembling their animated WWE Slam City characters, 2016 Funko WWE Mystery Minis Series 2 stays true to the icons and their unforgettable looks. In particular, Stone Cold Steve Austin, Sting, Goldust and Brock Lesnar mirror their true life images perfectly. Just like an RKO, there is a surprise in every box. 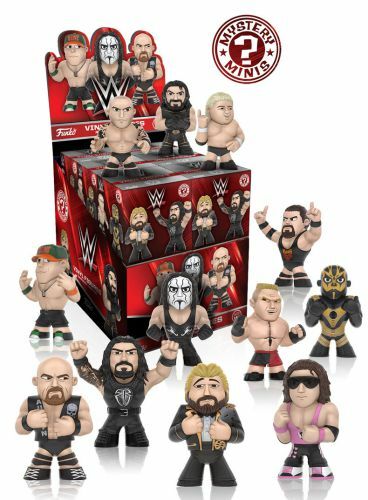 Each 2016 Funko WWE Mystery Minis Series 2 figure is issued in a blind-box format and packaged by the case. Because every box is intended to maintain similar weight and appearance, this helps keep the miniature wrestler unknown until opened. 2016 Funko WWE Mystery Minis Series 2 has just 12 WWE Superstars listed, giving collectors a greater chance to find the full set more easily than most Mystery Minis releases. This is especially true considering that each case contains 12 figures. Jake "The Snake" Roberts, Razor Ramon, and Sgt. Slaughter mystery minis can be found exclusively at Target. The overall Target odds for each figure is 1:12. Each 2016 Funko WWE Mystery Minis Series 2 figure stands approximately 2 1/2” tall.